Trompe L'Oeil, Murals and Ceilings hand painted by Yves Lanthier. Presenting the Trompe L'Oeil & Murals of artist and author Yves Lanthier. 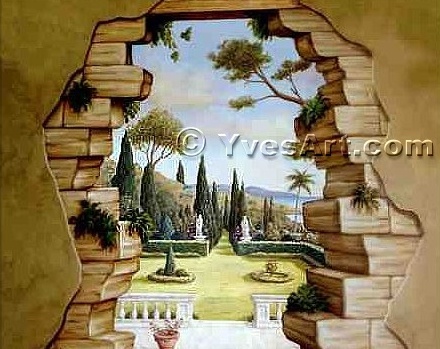 Yves Trompe L'oeil & Murals are available hand painted on site or on canvas. Yves will travel to any location around the world. Some reproductions are also available Giclée on canvas up to 16ft. wide by any length. Yves trompe l'oeil, murals and paintings can be found in celebrity homes such as Celine Dion and members of the Saudi Royal family. Since 1993 he has created original hand painted trompe l'oeil, murals and ceilings that embrace some of the largest and most exquisite estates in South Florida. They are featured in his book "The Art of Trompe L'oeil murals" which was published by F&W. Trompe l'oeil, murals, domes and ceilings, hand painted on flat surfaces creating a three dimensional illusion to fool the eye.
" Trompe-l'œil " is the Art of tricking one's perception of reality by painting 3 D on a flat wall, creating an illusion fooling the eye; "